Are you ready to learn about the effects of exercise on the cardiopulmonary system? I sure hope so because that is what this study guide is all about. As you will see below, this post is loaded with practice questions that can teach you everything you need to know about how exercise affects the body, heart, and lungs. 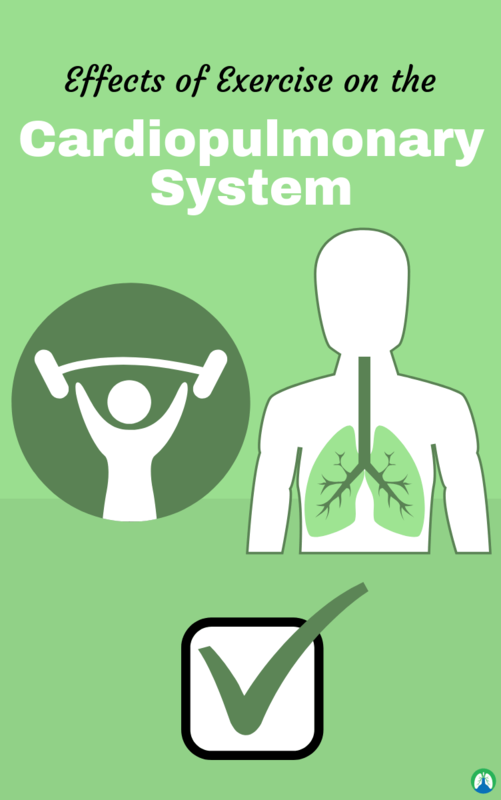 As a Respiratory Therapist, you will definitely need to know and understand all the different effects of exercise on the cardiopulmonary system. The good thing is, that is exactly what this study guide is going to help you do. So are you ready to get started? 1. What is bulk flow? It is the movement of fluids by the hydrostatic pressure gradient. It is the movement of fluids by the partial pressure gradient. It is defined as the movement of air from the environment to the lungs, and back, via inhalation and exhalation. Chemicals secreted by alveoli into the lumen of the alveolus to maintain the structure of the alveoli and reduce work done by lungs to keep alveoli inflated. 5. What is the diaphragm? Skeletal muscle for ventilation that separates the thoracic and abdominal cavities. It has high mitochondrial density which flattens as it contracts. 6. What are the intercostal muscles? Respiratory accessory muscles of breathing that help control the volume of the thoracic cavity. When we take a breathe in, i.e. inhalation. It occurs passively; the abdominals and internal intercostals decrease the thoracic cavity. Maximum Voluntary Ventilation is a rapid deep breathing for 15 seconds to estimate the ventilatory capacity. 10. What is the minute volume? The volume of air moved per minute. 11. What is the Valsalva Maneuver? Stabilizing abdomen and chest during heavy lifting, increase intrathoracic pressure, collapse veins reducing blood flow to the heart, decreasing SV and BP. 12. What is alveolar ventilation? Minute ventilation and anatomic dead space. The blood supply to gas exchange areas. 14. What is the V-P Ratio? Volume of air to alveoli and volume of blood in capillaries. 15. What are Type 1 alveolar cells? Simple squamous, and extensive gas diffusion. 16. What are Type 2 alveolar cells? Simple squamous, boxier, and secrete surfactant. 17. What are the pores of Kohn? It is the spaces connecting alveoli to disperse surfactant and enable gas diffusion between adjacent cells. 18. What are the roles of the conductive zone? It is the convective transport, humidification, add heat E, filter particulate matter, vocalization, and antibody secretion. 19. What are the roles of the respiratory zone? It acts in the gas exchange, produces surfactant, regulates molecular activity, regulates clotting, and endocrine functions. 20. What is the ventilation cycle? The diaphragm contracts, scalene/external intercostals move ribs up to increase thoracic cavity volume. Outside pressure, alveolar pressure causing air to move in. Gas exchange at capillaries. Diaphragm relaxes, abdominals/internal intercostals move ribs down to decrease thoracic cavity volume. And alveolar pressure which is outside pressure causing air to move out. 21. What are the benefits of the ‘bent over’ recovery posture? The reduce effects of gravity on inspiration (decrease strain on muscles), increase blood flow to the heart (decrease blood column height). 22. What is static lung volume? It is tidal volume and vital capacity. 23. What is the equation for vital capacity? 24. What is tidal volume? The volume of air moved in/out per breath (mL/min). 25. What is the dynamic lung volume? It is bringing air into lungs over a period, MVV/Ve. 26. What are the respiratory sensors? Chemoreceptors (H+) in blood and medulla, stretch receptors (stretch) in bronchioles. 27. What are respiratory afferents? Peripheral chemoreceptors, lung stretch receptors, proprioceptors in joints/muscles, core temperature, chemical state of blood in the medulla, pons, subcortical regions, motor cortex. Vagal efferent (ACh) and sympathetic efferent (NE). 29. What is the PaO2? It is the arterial pressure of O2. 30. What is the DRG? Dorsal respiratory group, input= CN X and CN IX (inspiratory stretch), output= diaphragm (phrenic nerve) and intercostals (intercostal nerve). Ventral respiratory group, input= pre-Botzinger complex (spontaneous firing), output= muscles (active expiration, pharynx/larynx/tongue to keep airways open). 32. What are thoracic cavity receptors? Peripheral chemoreceptors, receptors in lung tissue, proprioceptors in muscles/joints, core temperature, and chemical state of blood in medulla. 33. What are glomus cells? O2 sensors in carotid bodies (peripheral chemoreceptors). 34. What are stretch receptors? Stretch receptors in the lungs are sensing airway stretch. It is muscles and joints, sense movement. It is a rapid short breathing beyond 60% VO2 max. It is an increase in ventilation and rapid deep breathing. 39. What is unsatisfied inspiration? It is a mismatch between high drive to respire and work already exerted to respire. Chronic Obstructive Pulmonary Disease is classified as chronic obstruction of air flow that interferes with breathing and is non-reversible. 41. What are the problems associated with hyperventilation? Lightheaded (vasoconstriction), tingling fingers, loss of consciousness, and muscle spasms in the hands/feet. 42. What are the benefits of breath holding during hyperventilation? Increased PaO2 causes central chemoreceptors to sense H+ levels in the blood and restore normal breathing. 43. What are the chemical factors of hyperpnea? Peripheral chemoreceptors (sense O2), and central chemoreceptors (sense indirectly PaO2 via H+ in CSF). 44. What are the neural factors of hyperpnea? Cortical influence (activate motor cortex in anticipation) and peripheral influence (proprioceptors activated before it drops in pH). 45. What is the relation of COPD and exercise? Constricted airways make respiration especially difficult which limits the exercise capacity of the patient and reduces the overall level of activity. 46. What is the low-temperature effect on ventilation? It has no major effects. It increases water and heat loss. 47. What is high-altitude pulmonary edema (HAPE)? It is the filling of the lungs above 2500m. Debilitating headache, extreme fatigue, excessive rapid breathing and HR, pink excretion from cough, blue tinting of skin, vision disruption, poor reflexes, loss of trunk muscle coordination, and paralysis on one side of the body. 48. What is high-altitude cerebral edema (HACE)? The brain swells with liquid, staggered gait, dyspnea with exertion, severe fatigue, persistent cough, pain/pressure in substernal area, confusion, drowsiness, ashen skin color, and loss of consciousness. 49. What is the ventilatory threshold? It is the point where ventilation increases at a faster rate than VO2. 50. What is the Lactate Threshold? It is a point where exercise intensity corresponds with an accumulation of blood lactate. 51. What is steady state? Tv > BR, light/moderate intensity, and stable blood lactate levels. 52. What is non-steady state? Intense activity and rate of pulmonary ventilation > VO2 rate. It is an elevated CO2 level. 54. What is hypoxic hypoxia? Low PaO2 due to decreased alveolar ventilation, decreased PO2 in air, and abnormal V-P ratio. 55. What is anemic hypoxia? Decreased HbO2 due to low Hb concentration or altered binding. 56. What is ischemic hypoxia? Reduced blood flow to tissues due to heart failure, shock, and thrombosis. 57. What is histoxic hypoxia? The toxin decreases the ability to oxygen. 58. What are the hematological changes in response to hypoxia? There is a decrease in the plasma volume to increase % RBC and Hb concentration. 59. What are the causes of hypoxia? High altitude, excessive exercise, COPD, low Hb affinity, low PAO2, and traumatic lung damage. 60. What is Boyle’s law? Fixed amount of gas at a set temperature shows pressure and volume inversely related. 61. What is the cardiac output? The equation for cardiac output is: SV*HR. It is the volume of blood ejected from left ventricle per unit of time. 62. What is stroke volume? The volume of blood ejected from the left ventricle per beat. 63. How is the heart rate measured? Synthesized by adenylate cyclase and activates PKA. 65. What are pacemaker cells? Myocytes with low contractility found in SA node and unstable membrane potentials. 66. What is the Fick equation? (VO2= CO + [O2] arteries – CO*[O2] venous) or (CO= VdotO2 / a-vbarO2). 67. What is left ventricular hypertrophy? Characteristic of endurance training, increased VO2 max, lower resting HR (increase protein synthesis, myofibrils thicken, and increase contractile elements. It is the relaxation phase of blood pressure where the chambers fill with blood. It is the contraction phase (squeeze phase) of blood pressure where the chambers expel blood. 70. How can age affect the first phase of diastole? Atrial contraction force isn’t as strong so can affect cardiac output. 71. What is the second phase of diastole? Inlet and outlet valves are closed. Ventricular pressure rises above atrial pressure, so AV valves close (“Lub” S1 sound). 72. What is isovolumetric contraction? Ventricular chamber geometry changes. Heart rings itself out, misshapes then reshapes. 73. What is isovolumetric relaxation? Inlet & outlet valves are closed so ventricle is a closed chamber again. Ventricular pressure falls rapidly and AV valves open when pressure falls just below atrial pressure. 74. What can pace the heart, but at a slower pace, if the SA node is damaged? 75. How do you calculate maximal oxygen consumption? VO2 max = Q x arteriovenous O difference. 76. How do you calculate cardiac output? 77. How do you calculate stroke volume? SV = end diastolic volume – end systolic volume. 78. What is the Frank-Starling mechanism? More blood in the ventricle causes a greater stretch and contraction with increased force. 79. What is the average resting heart rate? 60-80 bpm and can range 30-100 bpm. 80. Your heart rate may decrease by how much after 6 months of moderate training? 81. What is pulmonary ventilation? Air in & out. Inflating & deflating of lungs, nothing with cellular respiration. It is the exchange of O2 & CO2. During exercise, the body has higher CO2 than O2. 83. How to calculate pulmonary ventilation? 84. The tidal volume generally plateaus at what percentage of the vital capacity? 85. Vital capacity is the combination of what? Max inspirational + max expiratory reserve volume. 86. What represents the sight of the highest vascular resistance due to the large pressure drop? 87. What is cardiac output? It is the amount of blood pumped out per unit time. 88. What is the result of venoconstriction? It results in an increased pressure within peripheral veins without a change in resistance, resulting in an increased venous return to the heart. This will cause RV hypertrophy. 89. In a healthy individual, Q should decrease after stopping exercise. What should happen to the endothelial wall? 90. What is vascular tone? The degree of constriction of a blood vessel which is relative to its maximally dilated state. 91. Putting an individual in the supine position will influence what? Preload because it eliminates the gravitational pull. 92. What will increase in a primarily high-intensity exercise? So there you have it. 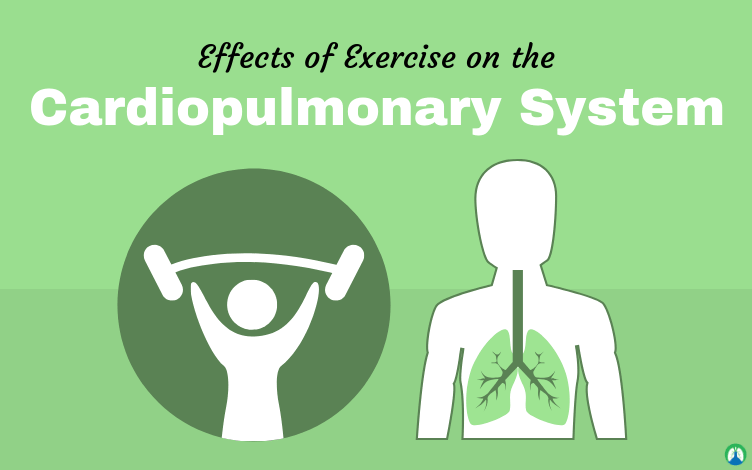 I hope this study guide can help you develop your knowledge about the effects of exercise on the cardiopulmonary system. I’m confident that if you can answers these practice questions, you can easily learn everything you need to know for Respiratory Therapy school. Thank you so much for reading and as always, breathe easy my friend.